A facilities engineer was designing a new tank wash for a Northern Alberta TRD (Treatment, Recover and Disposal) plant and contacted Alfa Laval. The facility was to handle a large number of trailers and tanks used to transport oilfield chemicals, drilling fluids, and waste and to process all received materials down to clean water, recovered hydrocarbons and class 1 and 2 landfill. A key design objective for the cleaning process to be efficient, reliable, and eliminate confined space entry. The common method of cleaning was not viable to handle a large quantity of 400 Bbl tanks. The local distributor worked closely with the engineering and energy service companies to optimize the cleaning process using Alfa Laval’s rotary impingement technology. A customized cleaning rig was built to position the 400 Bbl tank over a recovery pit. 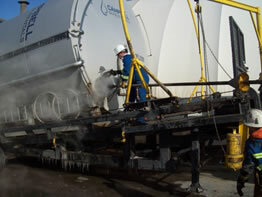 The cleaning process would then usually begin with steaming to unfreeze valves, a common condition in Northern Alberta. The Alfa Laval GJ 8, configured for 85 GPM at 150 PSI with a 20-minute cycle time, was inserted through the thief hatch (8” opening) on a long lance and positioned in the center of the tank. The device ran for 2/3 -cycle time blasting away the tank interior. The effluent was then cycled through the de-sludging and filtering processes and the cleaning water was reused. After several years of operation, the Alfa Laval Gamajet devices are still cleaning the toughest invert muds in less than 20 minutes and with a reliable and consistent cleaning pattern. Most importantly, manual entry for tank cleaning is completely eliminated. Routine preventative maintenance is performed on-site allowing for little to no tank downtime. With Alfa Laval, the TRD facility can process deliveries faster and turn around completely clean tanks while maintaining a safe and healthy work environment.